Despite heavy rains in March 1991, California continues to face a serious near-term water problem resulting from five years of drought. In fact, the amount of water in storage on October 1, 1991 was about equal to the amount in storage one year ago—a year in which strict conservation measures were imposed in some areas and there were significant reductions in water supplies for many agricultural users. 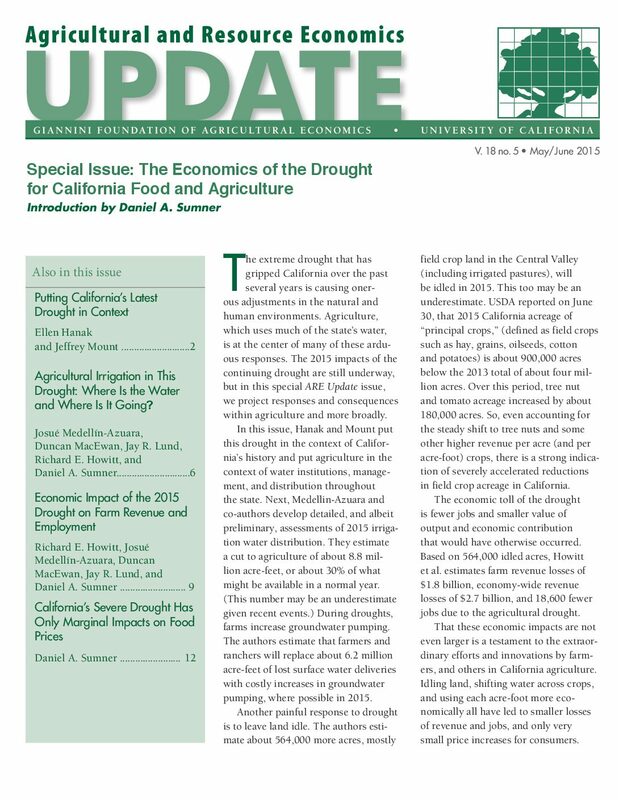 In this paper, we provide background information on California's water system, the impact of the drought, water needs in the future, and legislative options for coping with water supply limitations. Droughts are a recurring feature of California’s climate. Major droughts provide an opportunity to review management responses and derive policy lessons that can better prepare society for the next one. 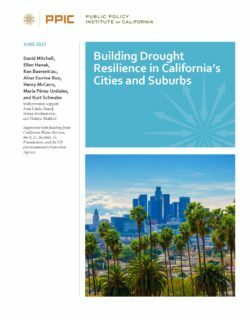 Here we take stock of how California’s cities and suburbs have responded to recent droughts, review the state’s evolving role in urban drought management, and recommend actions to increase urban areas’ drought resilience. California’s urban water supply system is complex and highly decentralized, with 400-plus utilities serving more than 90 percent of the state’s residents. Following the hard lessons learned from the 1976–77 and 1987–92 droughts, these utilities made substantial investments in drought resilience. This included diversifying supplies with new surface and underground storage, interconnections with neighboring suppliers, recycled wastewater, and water transfer agreements, as well as freeing up supplies by reducing indoor water use. Consequently, urban water suppliers generally believed they were prepared as the state entered a five-year drought in 2012. The water years of 2012-14 stand as California’s driest three consecutive years in terms of statewide precipitation, and as of this writing in February 2015 the drought is continuing on. 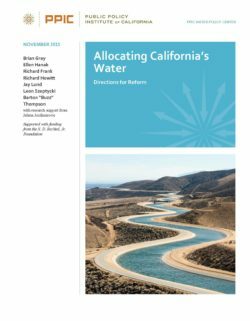 This report was prepared to compare the hydrology and impacts experienced during 2012-2014 with those of California’s largest historical droughts, in response to questions from local water agencies and others regarding the drought’s relative severity and the changed conditions since our prior major droughts. 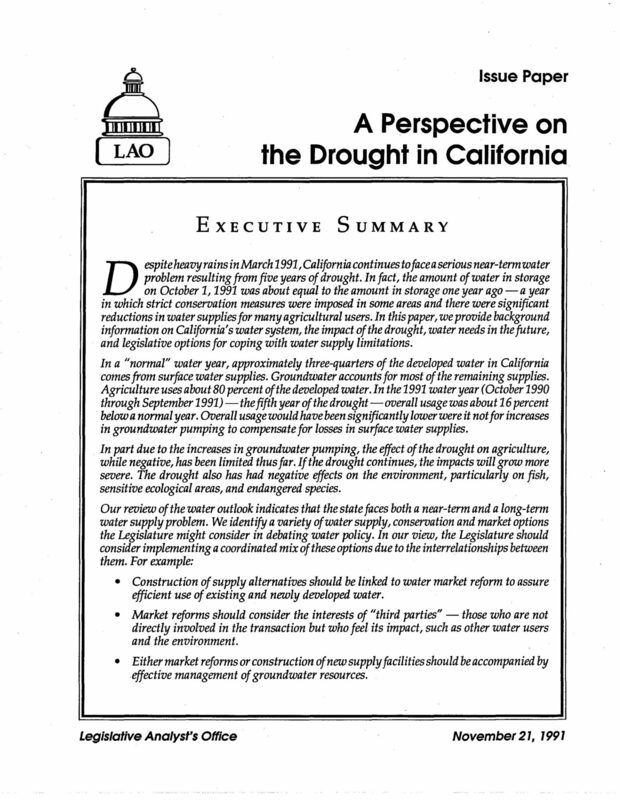 California’s immediately prior drought of statewide scale occurred in 2007-09; it was the first drought for which a statewide proclamation of emergency was issued. The 2012-14 period now marks the second time a statewide proclamation of emergency has been issued for drought. 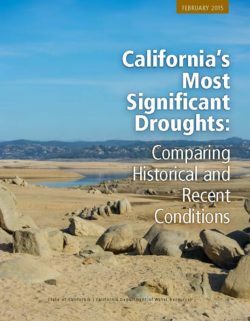 California’s most significant historical statewide droughts were the six-year drought of 1929-34, the two-year drought of 1976-77, and the six-year event of 1987-92. These droughts stand out in the observed record due to their duration or severe hydrology. The 1929-34 event occurred within the climatic context of a decades-plus dry period in the 1920s-30s whose hydrology rivaled that of the most severe dry periods in more than a millennium of reconstructed Central Valley paleoclimate data. The drought’s impacts were small by present-day standards, however, since the state’s urban and agricultural development was far less than that of modern times. The 1976-77 drought, although brief in duration, was notable for the severity of its hydrology. The 1987-92 drought was California’s first extended dry period since the 1920s-30s, and provides the closest comparison for drought impacts under a present-day level of development. The 2012-14 event set other records in addition to that of driest three-year period of statewide precipitation. The drought occurred at a time of record warmth in California, with new climate records set in 2014 for statewide average temperatures. Records for minimum annual precipitation were set in many communities in calendar year 2013. 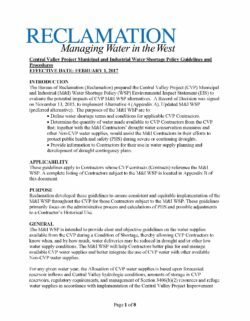 Calendar year 2014 saw record-low water allocations for State Water Project and federal Central Valley Project contractors. Reduced surface water availability triggered increased groundwater pumping, with groundwater levels in many parts of the state dropping 50 to 100 feet below their previous historical lows. These record-setting conditions speak to the need for continued improvement of our ability to respond to dry conditions. Knowledge of the impacts historically experienced in our past large droughts and the lessons learned during those events can help us be better prepared. This report was prepared in response to the dry conditions of 2012-14 (Figure 1.1) and particularly in response to the very dry hydrology of water year 2014. Water year 2014 ranked as the third driest on record in terms of statewide precipitation, with the three-year period of water years 2012-14 ranking as the driest consecutive three-year period on record in terms of statewide precipitation. 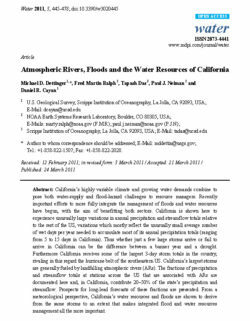 Continuing dry hydrology in 2015 raises questions about the similarity of present conditions to those of prior droughts and changes in observed impacts as California’s population increases and new institutional requirements are put in place. 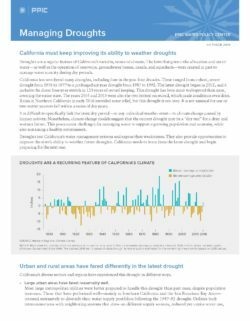 The purpose of this report is to compare present conditions with California’s most significant droughts of statewide scope, to help answer questions about the comparative severity of drought hydrology and drought impacts. The report also summarizes lessons learned and commonalities seen in the state’s most severe historical droughts. California is prone to multi-year droughts. Diverse, coordinated approaches are needed to stretch our water supply, ensure safe drinking water for at-risk communities, and protect the natural environment during dry periods. 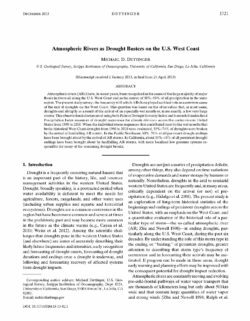 This brief describes the major effects of drought, and outlines adaptation strategies to manage them.